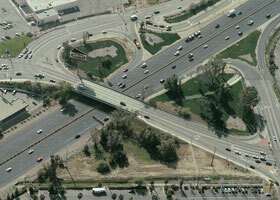 Work included the design plans and construction documents for widening Washington Street, Mt. Vernon Avenue, designing a new north bound off ramp, widening the Washington St. Bridge, improving 13 signalized intersections, traffic control and construction staging plans in a highly congested business district. Work included construction staking. Preparation of project report, plans, specifications and cost estimates for interchange and connector road to Glen Helen Park and Blockbuster Pavilion. Plans and specifications were completed and project advertised for bid in less than 60 days. Design and construction surveys for bridge structure, access roads, detours, side lateral drains, Day Creek Basin and inlet structures, Hysopp storm drain and utility locations and relocations. Project consisted of seven street crossings over new channel including State Routes 30 and 66 and 5 major roads. 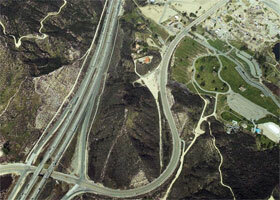 Construction staking was performed in accordance with Caltrans? Staking Manual.